Verne McCreedy is a City minifigure introduced in 2011 and one of the characters in the video game LEGO City Undercover. He was in Rex Fury's hot tub in his cell, and was also going to rob the LEGO City Bank before Chase McCain drove a jet-powered snowplow out of the bank. 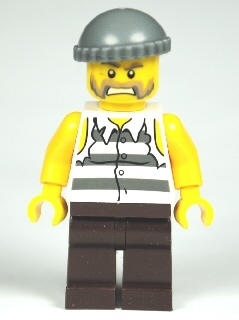 He is a member of Grubby Grubster's gang, alongside Hot Tub Harry and Dougy Dungarees. This page was last edited on 13 January 2016, at 00:09.